In my recipe box, filed under “cookies”, there’s a tattered and yellowed sheet of paper, written in my grandmother’s old-fashioned handwriting, for a cookie recipe I never really thought I liked. Now I make them almost every year. 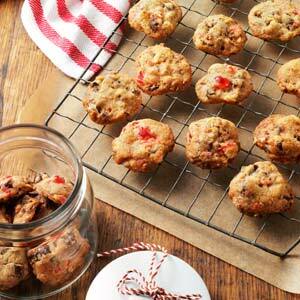 You all know about the tradition of fruitcake at Christmas. Did you know that it’s claimed that the ancient Egyptians actually placed an early version of fruitcake in the tombs of their loved ones? And please, no jokes about those same fruitcakes still being around now. I mean, really…. We’ve all heard the jokes about giving fruitcake for gifts at Christmas time. It’s an old joke that no one likes it. Well, guess what! I actually do like it, as long as it’s moist and overflowing with that sweet, sticky candied fruit we can only find in stores at the holiday season. I’ve actually made fruitcake once or twice, but since I’m the only one in the family who eats it, I gave up. Plus, as much as I like to bake, I don’t enjoy baking cakes. Cupcakes, yes, but cakes have never been my specialty. Probably because I’m no good at doing the icing, but that’s a different story entirely. Cookies are a different matter. They don’t have to look perfect, unless you’re doing those fancy cut-out ones, and that requires almost a degree in art, as far as I’m concerned, so I don’t make those. Besides, they never look like the pictures you see in the magazines. But these cookies are more creative, because I discovered you can vary the type of fruit you use, and actually use what YOU like, rather than what’s sold pre-packaged in the grocery stores, so I can still add a bit of my own creativity. You can, too. 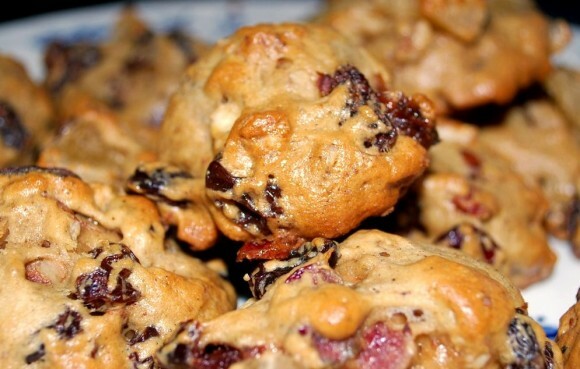 So if you’re feeling adventurous, why not try your hand at these cookies. Enjoy putting together your own combination of fruit, and see how they turn out. Add the nuts if you want, but since I don’t like nuts in my cookies, they’re all for you! It’s a bit easier to dust the fruit with flour and then add it. Mix together well and drop by teaspoonfuls on greased baking sheet. Bake at 325 degrees for 15 minutes. Let cool and store in tightly covered container. They’re good fresh baked, and even better after a day or two!